Dream Run |5 reel, 25 payline RTG progressive video slot. 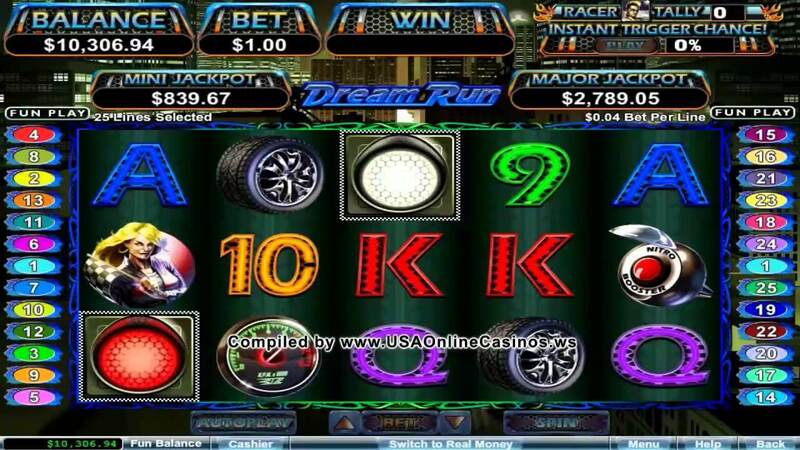 Dream Run is an action packed online video slot game produced by Realtime Gaming. The theme of this game is about street racing and features images of racers, car accessories and beautiful woman. The backdrop to the game is a cityscape with neon lights that illuminate the reels with vibrant colours giving the slot a modern and energetic feel. The graphics and sound effect are top quality with entertaining background music that all works together to produce a game that is entertaining and rewarding at the same time. The slot setup in Dream Run is a 5 Reel slot with 25 paylines. The game itself is jam-packed with bonus features including two wild symbols, scatter symbols, two bonus rounds and a progressive jackpot prize. On the reels, players will find images all pertaining to the illegal and dangerous world of street racing including, the racer, the opponent, the blond race starter, a pimped steering wheel, mag wheels, a hand gun, clocks and a nitro boost button. The standard high card symbols are used to complete the set of reel symbols. In the Dream Run real money online pokies, there are actually two different wild symbols. The racer plays the role of the first wild symbol. He can substitute for any of the other symbols except for the scatter symbol. The racer only appears on reel 1 and if he is used to complete a winning combination, the resultant win will be tripled. This makes the racer a very lucrative symbol. The second wild symbol is the opponent. The opponent works as a standard wild symbol. Appearing on reels 2 through to 5, the opponent wild symbol can be used to substitute for any of the other symbols except the scatter symbol. The scatter symbol in Dream run is the light symbol. When two or more lights symbols appear, the lights will either turn red or green. If players manage to land 3 light symbols and they all turn green, this will trigger the racing features. In the racing feature, players choose one of five cars to race. If players come first, they will win 25 free games with fifth place earning 5 free games. If players place in any of the top three, they will move on to a second race. In the second race, players win multipliers for their triggering bet. When players land the wild racer symbol during normal play, the total number is tallied. When players land a total of 10 racers, this will unlock the Nitro Racing Feature. The nitro racing feature is similar to the scatter symbol racing feature. Players must choose one of five cars to race. In the first race players win a certain number of free spins. If players qualify for the second race, player must compete to win bet multipliers. If players qualify for the third race, they will compete for a multiplier for their free spins round. If players qualify for the fourth race, they will compete for the progressive jackpot. If a player wins the fourth race, they will win the progressive jackpot.